Amboise is situated on high ground next to the Loire. Leonardo da Vinci lived here for the last three years of his life. 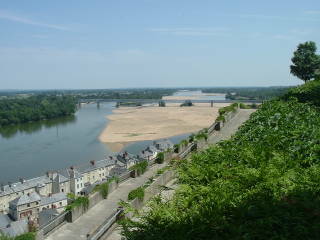 The high ground where the castle now sits was one of the largest Neolithic sites found along the Loire. Archaeologists found a remarkable female idol when they excavated in the 1950s. In the newer layers above, they found a late Bronze age foundry. There was a Roman settlement, not the grand palace with a colossal statue of Mars as fanciful 12th century chronicles speculated, but just a temporary camp where the Romans spilled some of their booty from raids. In the late 200s AD, local or regional tribes chased the Romans out for a while. By the 300s Latin text referred to the location as Ambacia, Ambatia, and Ambasi. In 504 Theodoric the Great, the king of the Ostrogoths, convinced Clovis, king of the Salian Franks of northern Gaul, to meet here with Alaric II, king of the Visigoths. Grand promises were made. Nothing came of them after Alaric was killed in battle in 507, and that's about all we know until the middle 800s. That's why it's called the Dark Ages. In 840 the Norse made it far enough up the Loire to burn the wooden bridges across the river. They came back to sack the castle in 853 and 878. 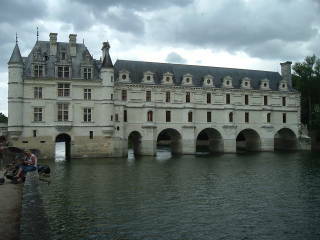 Things were much better in Amboise during the Renaissance. Actually, much better for the upper classes across much of Europe, that being why it's called the Renaissance. The Royal Castle was the home of the courts of King Charles VIII and King François I. François I invited Leonardo da Vinci to live in the Château du Clos-Lucé. Leonardo was born in 1452 near the town of Vinci, in the region of Tuscany. No family name, just Leo from Vinci or, as they said there and then, Leonardo da Vinci. He was the illegitimate son of a legal notary and a peasant. He had an informal education in Latin, geometry, and mathematics. At 14 he was apprenticed to an artist in Florence. At 20, in 1472, he qualified as a master in the Guild of Saint Luke, the guild of artists and physicians. Alexander, the former Roderic Borgia, was one of the more controversial popes. He openly admitted fathering children by his numerous mistresses. While he was Pope, his favorite mistress lived in the palace of a late Cardinal. Their children lived both there and at the Papal Palace. He made his son Cesare an Archbishop at the age of seventeen. 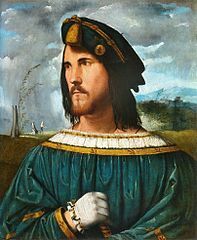 In 1482 he went to Milan. French forces invaded in 1499, and Leonardo fled to Venice. He returned home to Florence in 1500, and in 1502 began working for Cesare Borgia, the son of Pope Alexander VI. Leonardo's work as military engineer and architect for a part-time Archbishop and full-time Borgia kept him busy for a year, moving throughout the Italian peninsula with Cesare. Leonardo returned to Florence in 1503, and then returned to Milan in 1506 (with a stay in Florence in 1507 to settle his father's estate). In 1513-1519 he worked for Pope Leo X in the Vatican. Michaelangelo and Raphael were both working in Rome then. They were 23 and 31 years younger than Leonardo, respectively, eager young whipper-snappers getting on Leonardo's nerves. When François I of France met Pope Leo X in late December of 1515, after François had captured Milan, a position in France looked very attractive. François set Leonardo up in the Clos Lucé manor house, near the King's residence. It was a quiet place for Leonardo to work on his projects. He had brought along one of his favorite pupils, his loyal servant, and three paintings including the one he called la Gioconda or The Laughing One, commonly called the Mona Lisa. 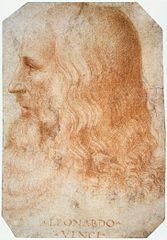 Leonardo was "First Painter, Engineer, and Architect to the King." He designed a system of canals to connect the Loire to the Rhône. He designed a château for the King, and urban layouts for cities. He lived and worked here until his death in 1519, becoming close friends with François. Things were going pretty well in Amboise — kings lived there, even Leonardo for a while — but then there were the Wars of Religion. The Conspiracy of Amboise is said to have started it in 1560, although tension had been building for some time as more and more of the nobility converted to Calvinism. This posed a threat to the royalty who were obligated to remain Roman Catholic in order to maintain the Pope's blessing and thus the power. Thousands were massacred and other thousands sold into slavery. Henry II had died from that infection in 1559, and the crown had passed to his young son François II. François was only 15 years old and was married to the 16-year-old Mary, Queen of Scots, giving her very pro-Rome family of the House of Guise an enormous amount of power. In 1560, a group of disgruntled Protestant nobles led by Jean du Barry, seigneur de la Renaudie, tried to abduct François II and eliminate the Guise and thus Roman influence over the French throne. The royal forces discovered the plot, and arrested and executed hundreds who were suspected of being involved. François II died later that year anyway, the crown passed to his 10-year-old brother Charles IX, and Mary returned home to Scotland. Four years later she married her first cousin, and three years after that his home was destroyed in an explosion and he was found murdered in the garden. Catherine de' Medici, ruling as regent until her son Charles IX reached 16, was Catholic. But the royalty was losing power compared to the private armies of the House of Guise on the Catholic side and the Protestant nobility on the other. 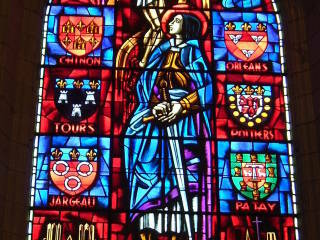 Catherine dealt with the Protestant House of Bourbon to counteract the too-powerful House of Guise. The government issued the Edict of Saint-Germain in January of 1562, allowing Protestants to worship privately within town and also enraging the House of Guise. A group of Guise retainers attacked a Calvinist service in Vassy-sur-Blaise, killing the worshipers and most of the residents of the town. That led to open hostility, with military forces fighting in the name of the King besieging cities seized by Protestant forces. Catherine negotiated the truce formalized by the Edict of Amboise in 1563, which (at least on paper) granted rights to the Protestants, but was largely ignored. There were more military battles, and civilian massacres, and years of what was basically civil war with a religious basis, until the mid 1590s. 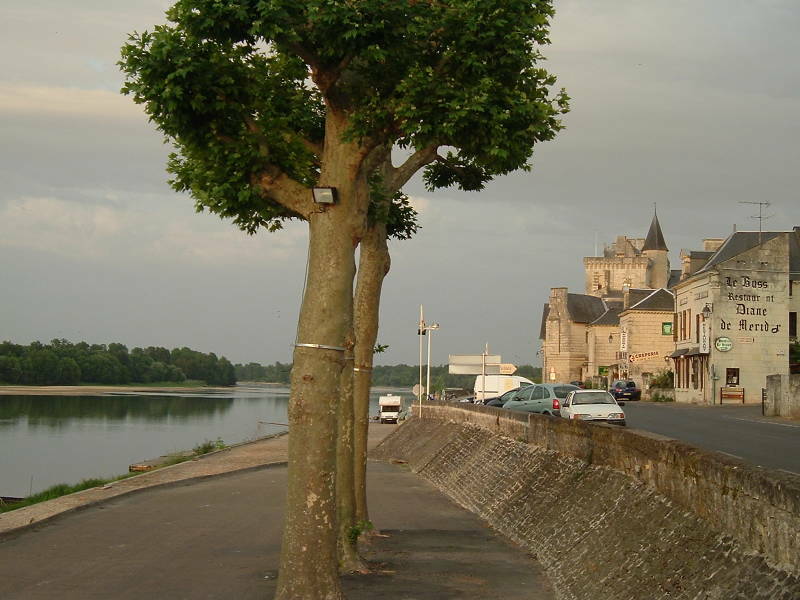 We will stop in Montsoreau to get dinner on our way back from days spent upriver or east of Saumur. 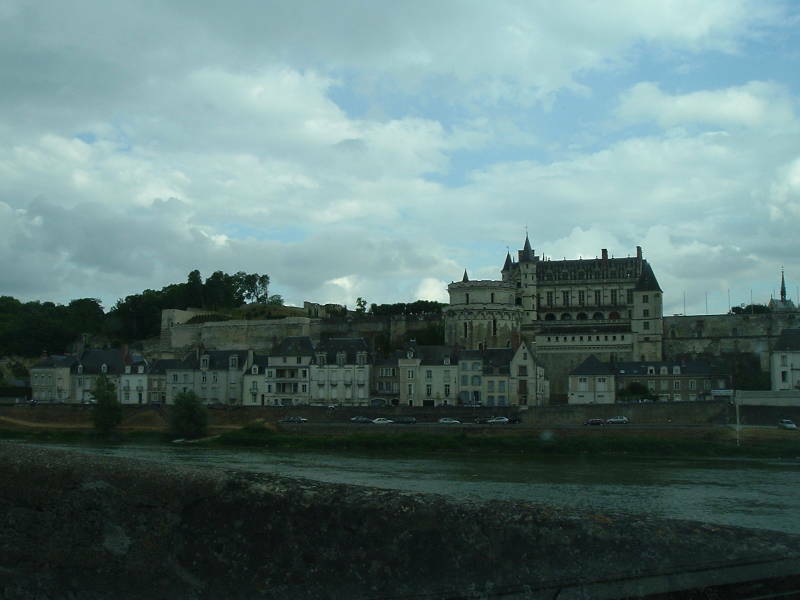 It's a small town near where the Vienne river joins the Loire. Montsoreau was mentioned in written sources in the 6th century, and there had been a Gallo-Roman settlement here before that. 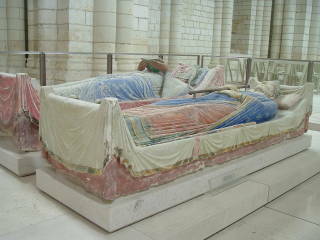 Eudes I, the Count of Blois, built a fortification here in 990. It was absorbed into the Anjou realm based to the north in 1001. The construction of the fortress led to a market town that became prosperous. It was a busy river port, trading in the wines from Chinon and Poitou, and wheat from Loudunais. Its population included artisans, fishermen, and winemakers, and it has never exceeded 600 people except during the early 1800s when it jumped to over 1,000 due to a boom in the local limestone. The local specialty stone, very soft and easily worked, was mostly depleted within 25 years. The stoneworkers left, and the population dropped back to about 600. Now there are about 450 people in Montsoreau. 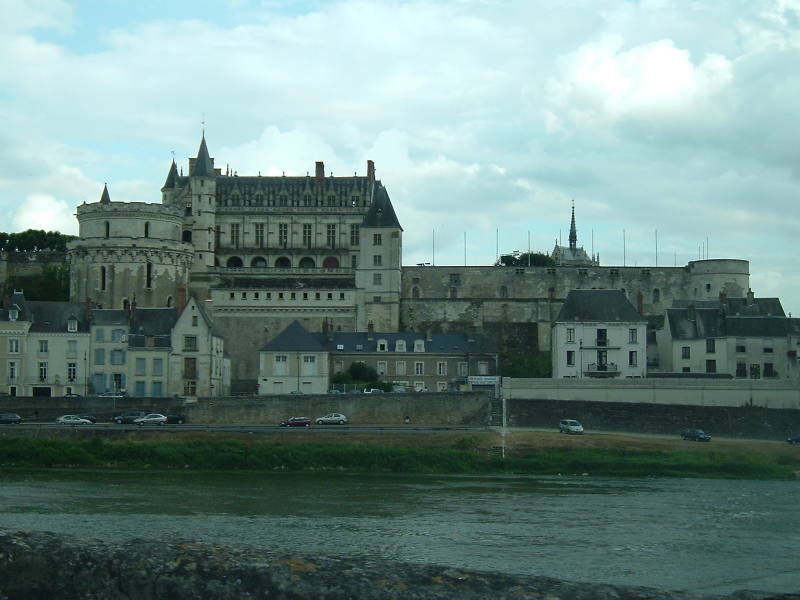 The Château de Montsoreau, seen below along the road passing through the town's riverfront, was built in 1455. The châteaux or castles were transitioning from military fortresses to stately pleasure domes. The large windows made for a pleasant interior while reducing defensive strength. The large increase in the number of chimneys meant that the interior could be kept at a higher temperature more comfortable for the civilians. The castle was built right on the bank of the Loire at the base of the hillside leading up to the vineyards and sunflower fields we saw above. 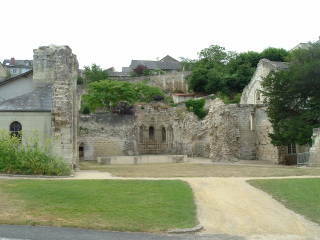 Alexander Dumas' novel La Dame de Monsoreau is set here. Written in 1845-1846, the novel is the middle of a trilogy starting with Reine Margot and ending with Les Quarante-cinq. 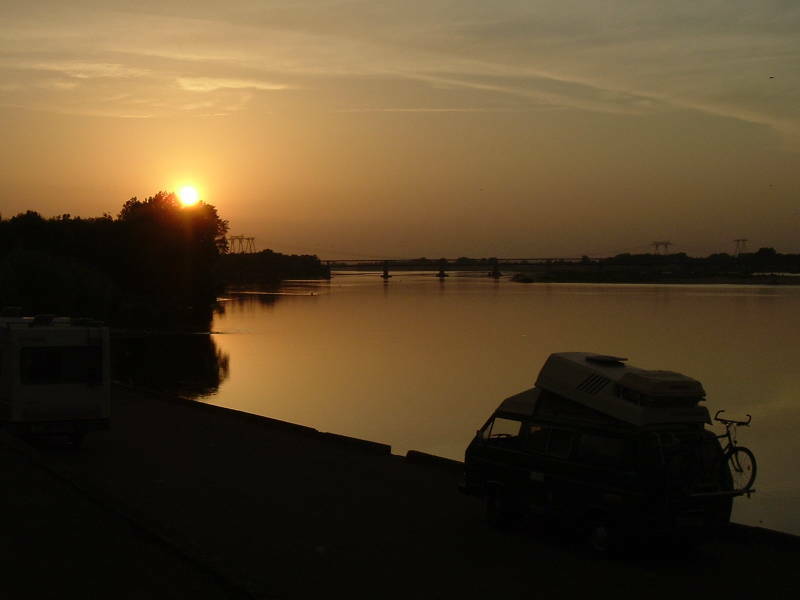 After dinner we will follow the setting sun back to Saumur. Finally, to Montreuil-Bellay, Saint-Hilaire-Saint-Floret, and Trèves-Cunault.